Whether you’re looking to soothe tired muscles after a day of skiing or just enjoy some peace and quiet, these Colorado hot springs are a great bet for a relaxing winter retreat. Check out our Quick Guide to 31 Colorado Hot Springs for more ideas. Why it's a must: One of the best hot springs in the state for families and the world's largest outdoor mineral hot springs pool, Glenwood's 3.5-million gallons give everyone room to roam, soak and play in Glenwood Springs. An on-site lodge, spa and grill ensure you never have to leave — and if you get too steamy in the pool, partake in the Nordic tradition of leaping out of the pool for a roll around the snow deck and a quick chill! Why it’s a must: This luxurious mountain resort in Nathrop boasts numerous geothermal hot springs, and its proximity to Monarch and Ski Cooper ski resorts makes it an ideal place to unwind after a long day of hitting the slopes. Soothe sore muscles in the resort’s 105-degree soaking pool, or get away from it all in the Relaxation Pool, which is available only to adult overnight resort guests. 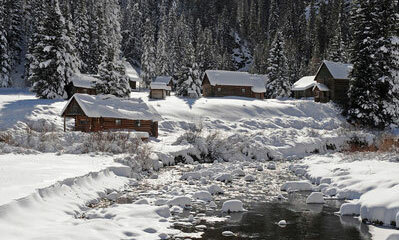 Why it’s a must: For a romantic weekend getaway, the rustic log cabins and piping-hot geothermal pools at Avalanche Ranch in Redstone provide the perfect escape. The property boasts two upper pools that range from 103 to 105 degrees, and the big pool stays toasty at an average of 90 degrees. After soaking, retreat to your private cabin and get cozy next to the wood-burning stove. Why it’s a must: The pinnacle of rustic luxury, Dunton Hot Springs in Dolores is a restored 19th-century ghost town, complete with authentic miners cabins, an old-fashioned saloon and dancehall and a cozy library. Get outdoors with their menu of winter activities (think: snowshoeing, cross-country skiing, snowmobiling and dog sledding) before relaxing in one of the numerous hot spring pools scattered throughout the property, ranging from 85 degrees to 106 degrees. Why it’s a must: Lounging in a steamy hot tub while surrounded by swirls of falling snowflakes is something everyone should experience in their lifetime. Get in on the tradition at Box Canyon Lodge in Ouray, where you can enjoy beautiful views of the San Juan Mountains while hanging out in a redwood hot tub, fed with 105-degree natural hot springs water. Why it’s a must: If the cold winter weather is making you stir-crazy, blow off some steam (literally) at the Old Town Hot Springs in Steamboat Springs. This sprawling recreation complex is part water park, part geothermal hot springs, and it comes loaded with amenities that will please the entire family. The facility is open to the public and includes eight hot spring pools, two waterslides, a fitness center, childcare and massage services. Why it’s a must: This peaceful retreat in the San Luis Valley town of Moffat is the perfect spot to rejuvenate your body and mind after the hectic holiday season. Enjoy sweeping views of the snow-covered Sangre de Cristo Mountains while relaxing in Joyful Journey’s elevated hot springs pool, which is filled with 98-degree natural mineral water. For the ultimate pampering experience, book a therapeutic massage or beautifying spa treatment.